Ring in the Golden Years in style and allow your guests to do the same. Commemorate this milestone by sharing these keychain 50th wedding anniversary party favors with your guests (great for 50th birthday parties as well). The number 50 is made of gold resin and is adorned with 3 rhinestones. The charm is securely attached to a chrome keychain. The entire favor measures 1" by 3" by 1/4" and comes individually packaged in a deluxe gift box with a black base, clear cover, and white organza ribbon. We top off each box with a gold wedding bell-shaped thank you tag. How much extra is it to add the couple's names? Can you send it to indonesia? I'm sorry, we do not ship outside the US at this time. 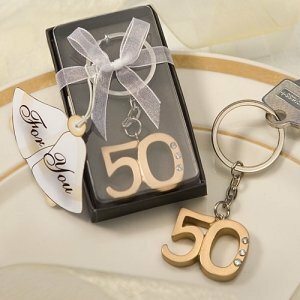 The number 50 is made of gold resin and is adorned with 3 rhinestones and the charm is securely attached to a chrome keychain. You can order a sample of it so you'll see how it exactly look before ordering it in bulk.